“When kids don’t have breakfast, or they haven’t had a meal for a long time, they don’t have enough fuel to actually get the brain going.” -Chrisa Arcan, University of Minnesota medical school. increase of 2.4% from the previous year. This finding illustrates the value of Minnesota’s efforts to provide students with a healthy breakfast each day, says Hunger Solutions Minnesota. The School Breakfast Scorecard measures the success of the School Breakfast Program at the national and state levels. The FRAC report finds that 48 low-income children in Minnesota ate school breakfast for every 100 that received free or reduced-price lunch during the 2013 – 2014 school year, a slight increase over the 2012 – 2013 school year. That compares to the national average of 53 low-income children who ate school breakfast for every 100 who also ate school lunch. “While Minnesota is currently below the national average in its rate of school breakfast participation, I applaud Governor Mark Dayton’s choice to include $28 million to fund universal free school breakfast for grades Pre- K – 3rd grade in his 2015 budget. This proposal would assist an additional 83,000 students. We are also supportive of Senator Alice Johnson’s proposed legislation (Senate File 344) that would expand free breakfast to all qualified students. Hunger Solutions Minnesota and our partners will work to advocate these measures as they will effectively address child hunger and family food insecurity,” said Colleen Moriarty, executive director of Hunger Solutions Minnesota. Low participation also means that Minnesota schools are leaving federal nutrition dollars on the table. For instance, increasing participation to 70 low-income children receiving breakfast for every 100 who eat lunch would lead to an additional $15,600,000 in federal child nutrition funding. 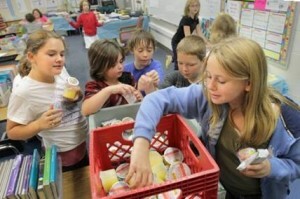 The full report, School Breakfast Scorecard, is available at http://www.frac.org. To measure the reach of the School Breakfast Program nationally and in the states, FRAC compares the number of schools and low-income children that participate in breakfast to those that participate in the National School Lunch Program. FRAC also sets a participation goal of reaching 70 low-income children with breakfast for every 100 receiving lunch as a way to gauge state progress and the costs of under-participation in the program. « Previous Article Proctor School District uses an Individual Meal Accounting System where each student has their own individual account.